If you have detected Web Warden application on your computer, you should know that you have to delete it from the system as soon as possible because the program might not only cause you some problems associated with your system’s security, but it might also disrupt your browsing session. The program itself might look very useful at first sight because it promises to make your browsing completely safe. However, you should know that it is a typical advertising-supported application. Even though it claims that its primary purpose is to ensure your web browsing safety, the truth is that it just seeks to advertise products and drive traffic to particular websites. It is very likely that the publisher of Web Warden receives money from pay-per-click websites. If you do not want to be a part of this, you should remove Web Warden as soon as possible. It might seem that ads generated by Web Warden might help you to save money while shopping online because it will display coupons and various deals; however, the truth is that these ads might take you to corrupted websites instead of helping you to keep your cash in your pockets. Therefore, we recommend that you ignore those advertisements completely and hurry to delete Web Warden from the system. If you do that, you will definitely prevent malicious software from entering the system. What is more, you will not reveal any of your details associated with browsing activities. “Sorry, our extension is down for maintence and currently unavailable” will appear on your screen if you visit an official website of Web Warden (web-warden.com) and click the Download Web Warden Here button. It means that the download is not working and it is impossible to download this application. As the program is still very active, the security experts at pcthreat.com believe that it uses the distribution method called “bundling”. It means that it travels bundled with other applications. Unfortunately, it is very likely that those applications are unreliable as well; thus, if you have already detected Web Warden on your computer and cannot remember downloading it yourself, it is very likely that it has entered your system together with other suspicious applications. You should delete them all as well. In order to eliminate all the infections from your PC, including Web Warden, you should scan your PC with a trustworthy malware remover. It is also possible to delete threats manually as well; however, you will have to do that one by one, whereas security tool will delete them all at once. 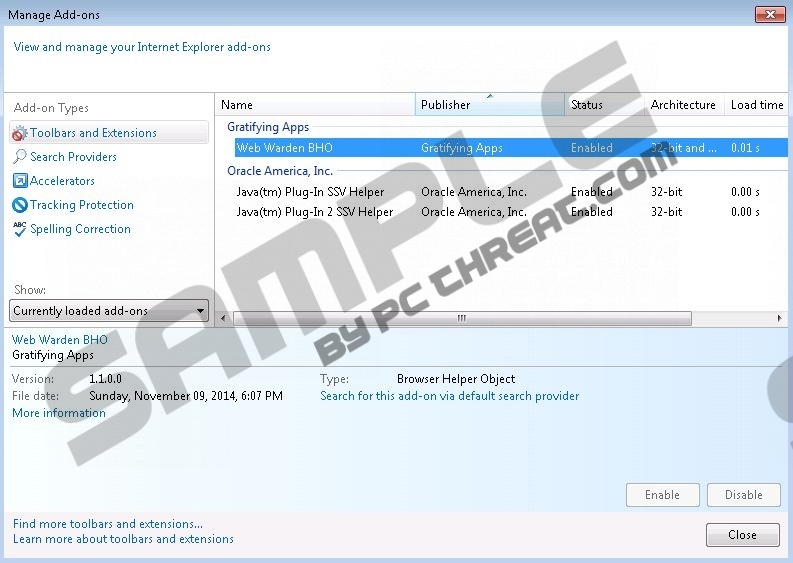 We recommend using SpyHunter for this matter because this tool is capable of detecting and removing different kinds of unreliable applications. Quick & tested solution for Web Warden removal.